Perfect for storing, protecting and transporting all your stuff! Great for classrooms, recess, sport programs and PE classes! These huge, rugged totes are perfect for storing, protecting and transporting all your stuff! 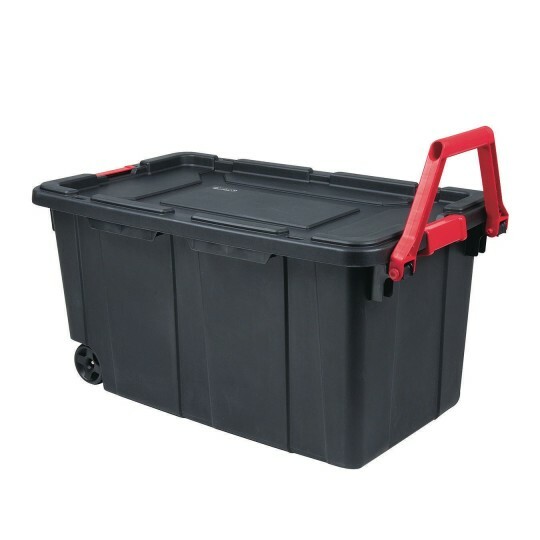 The 40 gallon totes measure 35-1/2" L x 21" W x 17-1/2" deep and come with locking latches, 2 built-in wheels and convenient flip out handle. Deep recessed lips allow for secure stacking and key holes provide options for tie downs to keep totes in place when transporting. 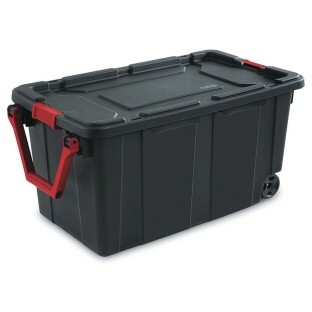 The polyethylene material withstands cold temperatures making them ideal for storing items in unheated areas. Great for classrooms, recess, sport programs and PE classes. We were looking for a secure storage container for yoga mats and towels. These containers have everything we were looking for easily transported ability to put a lock on the four corners sturdy and stackable. All smiles and no complaints here!